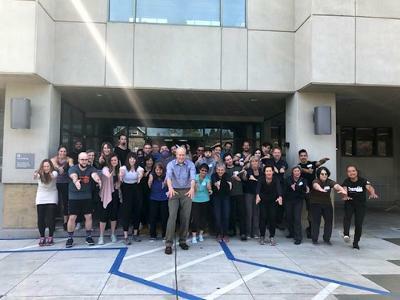 What a group of course attendees that came to Postural Respiration hosted by Alta Bates Summit Physical Therapy in Oakland, CA! First timers really shined in terms of curiosity and questions to absorb the foundations of PRI. There were students that traveled as far away as Alaska, Hawaii and Washington State. The course started out with definitions. What is posture and how do you define it? What is neutral rib alignment in a dynamic, tri-planer context? What does respiration have to do with posture and alignment? The veterans with PRI were exposed to the new and revised Postural Respiration course and the feedback from them was really enthusiastic. One of the new attendees wanted just a little more lab time so he was chosen as the subject of a review of all of the AIC/BC tests Sunday afternoon. Non-manual and single person manual techniques did not get him inhibit is neurological system and at 3:45pm on Sunday, a little PRI magic had to appear! After all, it was the bottom of the ninth, nearly 40 pairs of student eyes are watching and is the student going to experience what it is like to be neutral for perhaps the first time since he was an infant? Taylor Lewis, PRT, a veteran lab assistant (And great guy who uses PRI with Cystic Fibrosis patients) assisted with a two person infraclavicular pump. This young athletic man who was demonstrated on was also a prime example of what one would imagine as having perfect posture on visual inspection (could even win an award for it!) standing nice and tall. Problem was, all of his PRI tests were positive and he was neurologically extended head to toe! After this two person manual technique was performed, all PRI tests became negative, much to his delight including class attendees and maybe even the course instructor! He sat up and said "I feel sooo good and relaxed!". Lab this weekend with testing, non-manual techniques and manual techniques was totally fun for everyone and was a great balance to didactic learning going from concept to experience and then having this last lab to send everyone home with as to what is possible when you just keep exploring treatment options with PRI techniques. Thank you Taylor Lewis, PRT, Carol Kahn, PT, PRC as my lab assistants but also thank you ,Tim Dempsey, PRT, for attending while also helping as a third assistant over the weekend. These courses take a lot of work by the host site. Thank you Shaun Buchanan, PT, Marcela Larrondo, PT, Joan Sheppard-Mellows and the rest of the supporting crew from Alta Bates Summit Physical Therapy. 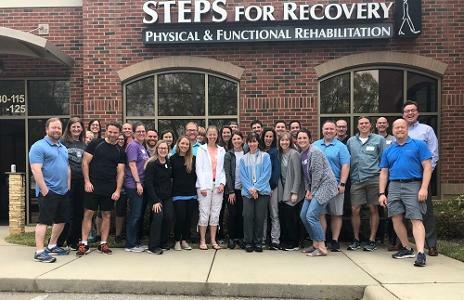 Josh Olnick, DPT, PRC was an excellent host at Steps for Recovery for the most recent Installment of Impingement and Instability. Being with Josh is always a treat for me because of his valuable insights and thoughtful contributions. This trip to his clinic reminded me of a trip I made to Wake Forest back when Josh was a new clinician where I was snowed-in in Minneapolis on Friday and didn't arrive until noon on Saturday. We had to get right to the point and modify things a little bit during the presentation to give the attendees the best experience possible on a modified schedule. Josh has since commented that the modified approach to the Myokinematic Restoration material that weekend was a super learning experience for him and he loved the modified format. Well, this Impingement and Instability course was also unique in several ways. First, because there were 9 PRCs/PRTs in the room and 4 of those were fellow faculty or affiliate faculty members at the institute, Jen Poulin, Dan Houglum, Lisa Mangino, and Advanced integration speaker Jean Masse. The rest of the course attendees had been to multiple courses, so we had a very seasoned PRI group to say the least. I love the Impingement and Instability material because it allows us to explore the application of the PRI science at a secondary level, beyond the introductory level so many people are familiar with from our introductory courses. It allows us to address several myths that emerge from the introductory material, that may seem true at an introductory level, but prove false at a secondary or advanced level. 3 myths that were discussed with this group are which side is truly the problem side? Do we seek to flex or extend? Is the right upper trapezius a problem or an important part of the solution? We had a refreshing and inspiring discussion on all of these topics and we were able to advance the thinking of a very forward thinking group. Some of the feedback from PRCs includes: "This is my third I&I and it is clearly evolved, targeted and refined- tremendous emphasis on left posterior mediastinal expansion", "Loved James' version and simplification of difficult integrated concepts. My best understanding of femoral instability and posterior mediastinal expansion importance in all non-manual techniques" and "Great clarity on the sequence of left low trap vs right low trap. My favorite course in all the PRI courses". Thanks to everyone. it was great being there with all of you. And a special thank you to my new friend Isabella, daughter of PRC Jaime Blanton. Not only did she bring the smiles, the artwork and serve as a model for our new upcoming PRI Integration for Pediatrics course, she took the I&I group picture, all by herself. Way to go Isabella!! This past week, at our Annual Interdisciplinary Integration Symposium, we presented the PRI Director’s Dedication Award to three very deserving individuals who have had a tremendous impact on our Institute over the years; Donna Parise Byrne, Dan Houglum, and Josh Olinick. The PRI Director’s Dedication Award was established by the Board of Directors (Ron Hruska, Janie Ebmeier, Jennifer Platt and Bobbie Rappl) in 2012 to recognize individuals’ ongoing dedication to their advancement in PRI. Past PRI Director’s Dedication Award recipients include: Susan Henning and Joe Belding (December 2012); Kyndall Boyle and James Anderson (April 2014); Michael Cantrell (December 2014); Jason Masek (April 2015); Michal Niedzielski (December 2015); Jennifer Poulin and Lori Thomsen (April 2017); and Kentaro Ishii and Sayuri Abe-Hiraishi (December 2017). 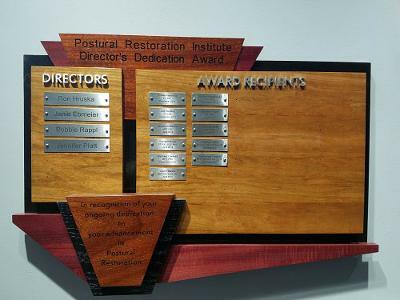 An award recognition plaque is displayed at the Postural Restoration Institute® in Lincoln, Nebraska, recognizing each of the PRI Directors Dedication Award recipients. Donna Parise Byrne attended her first PRI course in 2009, and has taken 28 PRI courses since that time. She was a member of the 2012 Postural Restoration Certified™ (PRC) class. Donna's background and love for Pilates led to discussions with Ron Hruska about PRI's integration with Pilates very early on in her PRI journey. This later led to her involvement with the PRI Affiliate Course, PRI Integration for Pilates, which was offered for the first time in 2017. Those who have attended this course, have loved it, and we look forward to watching it grow in attendance in the coming years. Donna owns Pilates Central in Wilmette, Illinois, where she has hosted several PRI courses over the years. Dan Houglum attended his first PRI course in 2004, and over the past 16 years he has attended 45 PRI courses. He was also a member of the 2012 Postural Restoration Certified™ (PRC) class. Dan spent much of his early career working in corporate PT/rehab settings, and in 2015 he opened Houglum Physical Therapy so that he could offer one-on-one hour long patient care at two locations: Pilates Central (with PRC colleague Donna Parise Byrne) in Wilmette, Illinois, and The Trainer's Club in Deerfield, Illinois. Dan joined the PRI Faculty in 2016, and teaches Myokinematic Restoration. 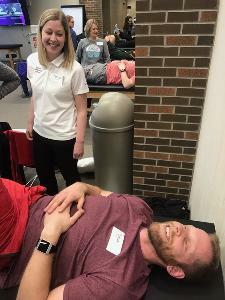 His students love him, and his background in athletic training, corporate PT, and now private practice offers a great blend of experience to all of those attending. He has put together a wonderful white paper to help colleagues and students further titled, Hruska Abduction and Adduction Lift Tests as Related to the Gait Cycle. Josh Olinick attended his first PRI course in 2006 as a PT student, after being introduced to PRI by Kyndy Boyle (a past PRI Directors Dedication Award Recipient) who was on faculty at Elon University. Josh and his wife Katie own STEPS for Recovery in Chapel Hill, North Carolina, a clinic which offers physical therapy, occupational therapy and speech therapy. Over the past 14 years, Josh has taken 31 PRI courses. He was a member of the 2011 Postural Restoration Certified™ (PRC) class. In 2010, Josh co-authored "The Value of Blowing up a Balloon" with Kyndy Boyle and Cynthia Lewis, which was published in the North American Journal of Sports Physical Therapy. Josh's background in engineering makes his brain fit for PRI, and he is always askign great questions, he frequently submits ideas and white papers (see all of his papers on his bio here) to help others learn and understand PRI better, and he always has his patient's and other PRI colleague's back. In his spare time, he has hand-crafted around a dozen PRI logos in all kinds of woods, which are proudly displayed in clinics across the country. Congratulations to all three of these wonderful individuals. We are so honored and proud to know you and have you associated with our Institute! CLICK HERE to view all of the photos from the award presentations. 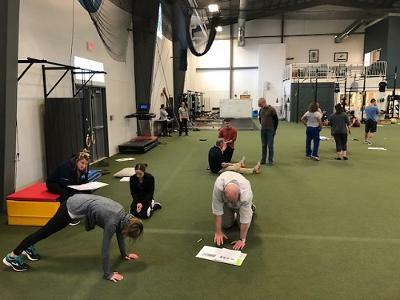 James and I had a couple of fun days in Brunswick, Maine teaching the PRI Affiliate Course for Fitness and Movement. The New England region is a hot area for PRI. Thank you to the wonderful team at Costal Ortho for hosting! It was a perfect host site that allowed us plenty of lab space to explore dimensions of breathing and various movement patterns. 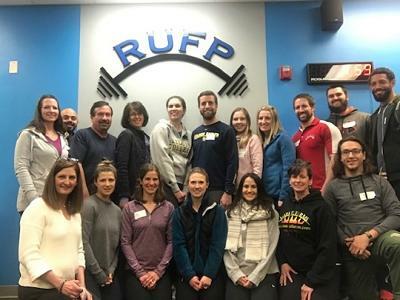 We had an awesome group and great mix of intellectual minds from personal trainers, strength coaches, athletic trainers, physical therapists, yoga instructors, chiropractors, RN, osteopathic physicians, and structural integration specialists. It was a full course! I love having a diverse audience and truly believe that PRI can be a uniting framework that helps us better integrate, coach, and lead more people to better movement. This course has application for all. Hear from 3 course attendees! Thank you to Noah, Jonathan, and Cheryl for typing up a few words to share with you all! I hope to be able to visit Maine again, it was beautiful…. and the lobster was yummy too! Thanks again to the #PRInation up in the New England region! Next course for PRI Fitness and Movement is another international destination, Sydney Australia!!! June 22-23 we are excited to teach at Fitwell Plus in Sydney, NSW. PRI Australia... sign up today! There are still some slots available! Get registered and please help spread the word!